When TDmonthly Magazine quizzed 15 specialty retailers about their best-selling outdoor toys, the results were clear: kites, stomp rockets, blast pads and sleds kept kids occupied once they left the house. As a creative, educational action toy, it’s loads of fun — kids jump on the air bladder to launch a 9" all-foam rocket into the air. The Junior Stomp Rocket is used by science teachers to help children learn about trajectory, force and motion. It is also valued by psychologists, physical therapists, special-ed teachers and parents of children with special needs. “Stomp Rockets are recognized for their positive contribution to the lives of millions of children and adults around the world,” Frank Reed, of D & L Company, told TDmonthly. Awards: Top Toy of the Year 2005, Creative Child Magazine; Excellent Product 2005, iParenting Media. 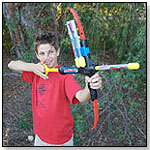 — Six of 68 retailers said in fall 2008 that the Stomp Rocket is their best-selling flying toy. Holly Anvers, manager of Ages & Stages Toy Box in Golden, Colo., cited sales of about 40 units per month in late fall 2009. — In autumn 2010, Marc Holcomb, owner of Toys & Co. In Greensboro, S.C., said he sold approximately 50 per month per store. “It's our #1 gift item,'' he told TDmonthly. This launch system features a flex tube that stretches to nearly 3’ and won’t restrict airflow. It only blasts vertically (9 degrees either way), using Metalix™ missiles (three included). The parts store in the base, and the product is also available in Electric Extra Terrestrial Green and Exploding Sun Yellow. — Two of 66 retailers told TDmonthly in July 2008 that this product is one of their overall best sellers. Five of the 66 named it as a best-selling gift item for boys. Three of 39 retailers listed Blast Pads as their best-selling item for tween boys during an October 2009 survey. “I've been accused of giving them away with how fast I go through them,” Jude Larene, owner of Izilla Toys in Seattle, Wash., said in March 2009. — “Blast Pads from Marky Sparky were our biggest sellers last year,” Joe Berardoni, owner of Pun’s Toy Shop in Bryn Mawr, Pa., told TDmonthly in spring 2009. Of 47 retailers, two told TDmonthly in June 2009 that Blast Pads top their sales of boys' items, reporting figures of seven to 15 sold per month. "We sell that all year. 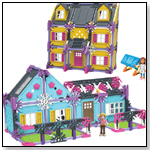 Every time we get them in we sell out," reported Kim Haynes of Lollipop Toy Store in Dawsonville, Ga., in March 2010. —‘’We sell at least one per week, sometimes more,’’ said manager Gwen Bowden of Doodlehopper 4 Kids in 1Q 2011. Hot Air Balloon Kite by PREMIER KITES INC.
Other products from PREMIER KITES INC. Designed to resemble a hot air balloon, this whimsical nylon kite features a durable but lightweight fiberglass frame. — Five of 43 specialty retailers told TDmonthly in May 2010 that kites are a best seller. Mike DiAndrea, manager of Hardware Center Inc. in Paoli, Pa., which stocks Premier Kites, cited sales of 65 kites in April 2010. —"They have a really good quality," said Ginger Milligan, co-owner of Fantasy Island Toys in Fairhope, Ala., in 1Q 2011. — Teresa Derry, owner of Annie's Toy Chest in Cocoa, Fla., told TDmonthly in a November 2014 survey that Premier Kites is their store's best-selling brand of flying toys. Superflyer ? 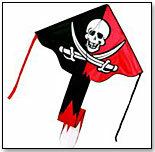 Jolly Roger by GO FLY A KITE INC.
Other products from GO FLY A KITE INC. Kids can set sail in the skies with this easy-to-fly Superflyer kite from Go Fly a Kite. Constructed of durable ripstop nylon and a tough fiberglass frame, this kite is built to provide an endless number of fun summer days. The Jolly Roger is one of several different themed appliqués and prints offered on the Superflyer. Complete with flight line on a handle and a stabilizing tail, the Superflyer is a breeze to assemble and aerodynamically the easiest kite to fly. — “We carry kites on two levels: for those that just want to fly a kite and those that want a challenge. Go Fly a Kite does the best job for all levels,” said Jeri Dorsey, buyer for Kaboodle LLC in Carmel, Ind. — Kites are strong sellers at Amazing Toys in Great Falls, Mont. “Adults will buy one for the kids and one for themselves,” Owner David Campbell told TDmonthly. Zipfy ? The Freestyle Mini Luge by GREAT CIRCLE WORKS INC.
Other products from GREAT CIRCLE WORKS INC. Inspired by the Olympic sport of the luge, the lightweight Zipfy (less than 3.7 lbs.) is compact and fast. Made of high-density polyethylene plastic, it is engineered for performance, safety and maneuverability on every type of snow. It features a feet-first design so that riders can control their speed and stop by digging their heels into the snow. It makes for a great family sport and comes in electric eel green, firefly red, and black diamond colors. “With a low center of gravity and the rail design on the underbelly of the sled, riders can carve down the slopes, simply by leaning into the turn,” Mark Cahsens of Zipfy Inc. told TDmonthly. Launch date: October 2007. — Joe Berardoni, owner of Pun's Toys in Bryn Mawr, Pa., told TDmonthly in late fall 2009 that the Zipfy was one of his top-three best sellers. — "I sold 12 of the Zipfy luges last week. The sleds are awesome," Jeanette Lauture, owner of Aunt Jean's Toys & Treats in Montclair, N.J., told TDmonthly in early December 2009. —"During the Christmas season this past December, we sold over a hundred," Joe Berardoni, owner of Pun's Toys in Bryn Mawr, Pa. , told TDmonthly in early 2011. The Wham-O Boggan provides a fast, maneuverable and sturdy ride down any snowy slope. It can carry two people and is made of super-slick polyethylene and super-light plastic. The Wham-O Boggan possesses cutting-edge arrowhead design for speed and control, has four side handles for riding or carrying, and includes a tow-rope for pulling and transport. It's also crack-resistant. The shipping weight is 7 lbs. — "For sleds, Wham-O is still good," said Roger Lee, co-owner of Olney Toys in Olney, Md. — According to Shanna Frieling, owner of Giggles Toys & More in Bozeman, Mont., "Wham-Os" are among the "best sellers in sleds" in her store. Everything about this toy is fake. We admit it. From the faux Black Ebony handle to the fake bow string. It's all fake. All fake except the performance. The Faux Bow was designed with only one goal: To be the best performing toy bow on the market. We beat all the competition by miles. Every Nerf® enthusiast's jaw will drop at the distance and accuracy of this beast. It out shoots and out distances everything in the class. My mom always told me not to judge a book by its cover. No truer words could be said about the Faux Bow™. Under its fake exterior lies the heart of a dragon (here comes the segue). So, if dragons are on the menu... Faux Bow™ is ready to do some slaying. Comes with 3 perfectly balanced Faux titanium arrows and one 3 arrow quiver. — "This Bow an Arrow is new from Marky Sparky - creators of the popular 'Doink It Darts.' The bow shoots 'arrows,' which are more-or-less the same missles sold in Marky Sparky's popular 'Blast Pad' rockets. The rockets worked well and seem to be a good addition to a strong line," Joe Mitchell, owner of YoYo Joe's Toys & Fun, told TDmonthly at Toy Fair 2010. — “Those things fly out of here,” unintentionally punned Christine Osborne, co-owner of Wonder Works in Charleston, S.C., in Fall 2010. 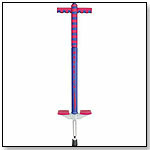 The JM Maverick Pogo Stick is designed to provide fun exercise for boys and girls from 5 to 9 years old. The precision, foam-covered metal construction includes replaceable, non-slip foot pads, handlegrips, and a rubber tip. The pogo stick supports users between 40 and 80-lb. It measures 38 x 9.5 x 2.5 in. —Two reviewers on Amazon.com gave this product five out of five stars for high quality and durability. 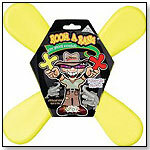 This soft foam boomerang toy can be thrown indoors or out. —Porter Green, owner of The Curiosity Zone in Ashburn, Va., sells about a dozen a month. Kids can slide down the giraffe’s back and get sprayed by its mouth in this inflatable pool. 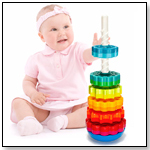 •What Is an Eco-Friendly Baby Toy? •The Nintendo 3DS – Will It Rescue the Video Game Space?